I saw posters for Emily St. John Mandel around my local library for quite some time, probably starting in summer. It was one of those posters you see everywhere, but you never actually read because you’re too interested in checking out every other book in the library. But then, near the beginning of this school year, when my beloved school librarian started to promote it, I really took notice. My school librarian is such a sweet lady. She got several free copies of Station Eleven to give to teachers, and since my mom works at the school, we got one of the copies. Maybe the purpose was for Mom to keep that book in her classroom, but she’s a choir teacher, and I’m an active reader; so, it lives on my shelf. Station Eleven is very unique for the fact that it goes back and forth between two different time periods; before and after the apocalypse. The interesting part is that Ms. Mandel never really mentions the time period of the initial apocalypse. Mandel came to my little town and was interviewed by a librarian, and they actually talked about this; she explained that the apocalyptic chaos that always happens, in a sense, isn’t what interested her. She was more fascinated by what she saw happening directly before and after, and with this book, it really works. 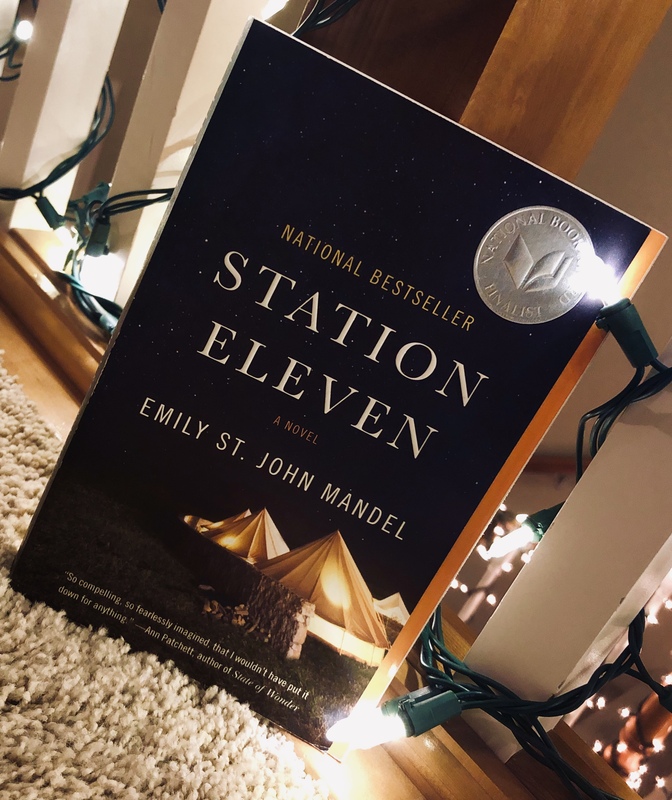 Station Eleven is, like I said, a book where the “apocalypse” has happened in the form of a terrible flu that wiped out ninety percent of the world’s population. We get to see the perspective of people before and when they realized the world is dying, from a wannabe doctor to an old, famous actor. We also see the aftereffect, following a band of musicians whose goal it is to keep music alive in their desolate setting. They run into opposition from a crazy religious group who believes anything they do is right, even hunting down a caravan of musicians who happen to “take” something they are after. It’s beautifully written. When Mandel was here, she thought of her book as a Literary Science Fiction, and yes, that’s what I would call it, too. I’m not usually a big fan of literary pieces, but it works for this book. Each chapter adds a layer of needed depth to this story, making us care deeply about her characters, both from the past and the present. And I don’t know if I’ve read an author who weaves so expertly between two time periods.